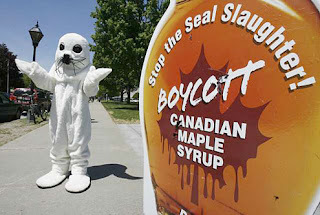 I didn't know we made Maple Syrup from Seals. Cool. thats BLOOD Maple Syrup :) The best kind! Its geographically sensitive, so while you saw your own ad, we didn't. Sadly. Yeah I know, although we're about to launch an online store, and will be expanding our ads to Ontario wide. You've blogged before den...make the address a link next time, I'm lazy dammit! I didn't expect to see this on House of Paincakes. Nicely done. Our Hive Cluster is Under Attack! NOTHING TO DO WITH TABLES! Video Bat Reps!